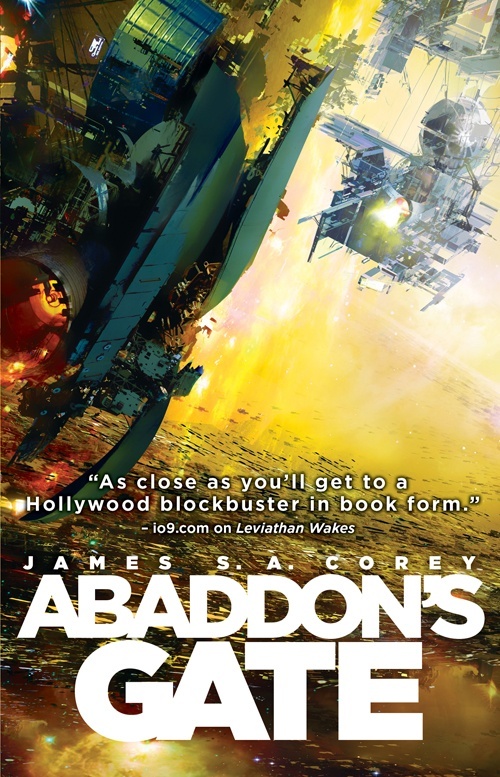 James S. A. Corey's Leviathan Wakes and Caliban's War both ranked among my favorite speculative fiction reads of 2011 and 2012. Understandably, I had rather high expectations for Abaddon's Gate. And somehow, Daniel Abraham and Ty Franck, the two authors behind the letter-filled James S. A. Corey pseudonym, managed to raise the bar even higher in this third installment! Indeed, in my humble opinion their Hugo-nominated and now New York Times bestselling Expanse sequence is the very best ongoing science fiction series on the market today! This is space opera on a grand scale as good as anything written by genre powerhouses such as Peter F. Hamilton and Alastair Reynolds. The worldbuilding was once again one of my favorite aspects of this novel. The fragile political balance between Earth, Mars, and the Belt, is at the heart of the story and threatens everything. As was the case in Caliban's War, I loved how Abraham and Franck handled the political facets of the different plotlines, as well as the repercussions the politicking generates in the greater scheme of things. I loved how the whole concept behind the Ring and what lies beyond could affect mankind so profoundly. I wasn't sure about the religious angle brought by the Anna Volovodov POV at first, yet it allowed the writers to explore the many themes underlying the story from a different, more spiritual perspective. Which, in the end, somehow added another dimension to what has become an extremely multilayered plot. Once more, the stakes become higher as the tale progresses. As ships from Earth, Mars, and the Belt speed toward the Ring to discover and perhaps lay claim to what lies in the starless space on the other side, the tension rises with each new chapter. And with what Holden unveils beyond the Ring, it appears that the series will reach new heights in forthcoming volumes. With each new installment, there is no question that the Expanse is a very complex science fiction tale. Which bodes well for what comes next! As was the case in both Leviathan Wakes and Caliban's War, a number of plotlines from Abaddon's Gate which appeared a bit out of place at the beginning all of a sudden become pivotal as the plot continues to move forward. It's another sprawling novel and it takes time for the story to finally make sense. But when it does, it makes for an even better reading experience! The characterization was once again "top notch." Do-gooder Holden is back as a POV character in this one and will probably continue to be present as the series progresses, but the rest of the POV protagonists are all new faces. As I mentioned earlier, Anna's point of view brings a more religious/spiritual perspective to the story. Bull's POV allows readers to witness what is occurring from a different angle. While interesting, at first it isn't always clear why Melba's POV was necessary. But as was the case in previous books, Abraham and Franck gradually bring everything together, and the disparate points of view add yet more layers to a tale that already echoes with depth. Abaddon's Gate is paced in a way that makes you beg for more, always promising yourself to read just another chapter, again and again. A veritable page-turner, this novel is almost impossible to put down! "As close as you'll get to a Hollywood blockbuster in book form." That's what io9.com had to say about Leviathan Wakes when it was released. I disagree. . . Although the Expanse does feature all the trappings of a good science fiction movie, Hollywood never came up with something this convoluted and intelligent. A blockbuster needs to satisfy even the lowest common denominator. Vast in scope and vision, Abaddon's Gate and the rest of the Expanse sequence, with its passionate and compelling characters, with its textured, detailed, and thoroughly imagined world, are shaping up to be one of the very best space opera series of all time. Believe you me: space opera doesn't get much better than this! While I don't think this book was bad I'm afraid I wasn't as taken with it as you obviously were. I'm glad you enjoyed it though! Strangely enough, I felt like your enthusiastic and positive review was very close to my feelings about the first two books in this sequence. The world-building was impressive and involving and the human dramas added a welcome depth. However, I felt this book was a relative disappointment. The world-building, though it does move forward, has revealed how far away we are from actual explanations and answers. You say the bar has been raised by this third instalment, I would say it has shown us that the finish line is way off in the distance. More importantly, the human dramas felt forced to me - the climactic moments of the book especially so. In my opinion, the authors fell very short of achieving the cathartic and redemptive climax they aimed for. That failure raises questions about the necessity of whole chunks of the book, which are clearly just setting up that denouement. As the character work has been one of the books' great strengths, this was a real disappointment. I still believe this series could end up being a worthwhile, exciting and satisfying one - the authors have shown that they are capable of that - but this volume has slightly reduced my expectations. I wish them good luck with the next book, and I look forward to reading it! I really enjoy the blog - thanks for sharing your views and enthusiasm! Agreed - this is also my favourite ongoing SF series right now.